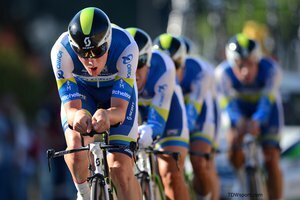 ORICA-GreenEDGE narrowly missed the top step of the podium and a world title in Florence, Italy in the team time trial at the UCI Road World Championships. The Australian outfit settled for the silver medal, an improvement over the bronze they earned in 2012, after stopping the clock .81” slower then repeat team time trial world champions Omega Pharma-QuickStep. Sport Director Matt White was full of praise for his squad that included Brett Lancaster, Daryl Impey, Jens Mouris, Luke Durbridge, Michael Hepburn and Svein Tuft. - greenedgecycling.com Brett Lancaster's SRM race file below illustrates the physical demands of an elite team time trial performance. Brett, racing at 80kg, holds a 2004 Team Pursuit Olympic Gold medal, as well as stage wins in the Tour of California, Giro d'Italia, and the 2013 Tour de France TTT.